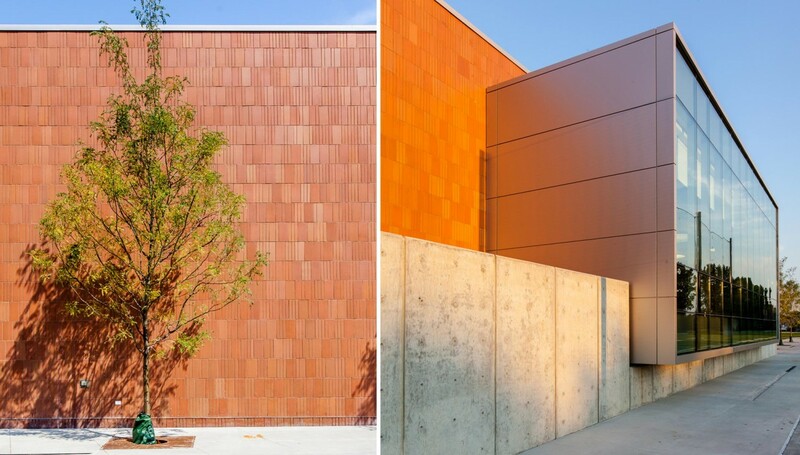 The innovative brick facade designed by STL exclusively for the Back of the Yards Preparatory School has been awarded the prestigious 2014 National Brick Award by the Brick Industry Association. The design features a one-of-a-kind masonry solution which achieves an astonishingly beautiful ceramic tapestry by mixing just three different types of ceramic units. STL explored the design of the unit with overall goals of increasing typical dimensions and providing a variation in unit size to promote pattern randomness. Working closely with brick suppliers and manufacturers to ensure special shapes could be produced and consulting the Masonry Advisory Council regarding constructability and budgeting considerations, STL developed a brick design based on a single nominal unit size of 4D x 16H x 8L inches. Vertical orientation of the unit was key to maintaining the 8 inch module length while increasing labor efficiency over a standard modular brick. The pattern was created by the factory blending of the three different variations of the same brick at 33% of each type of unit. The project was Awarded Best in Class in the K-12 School category.